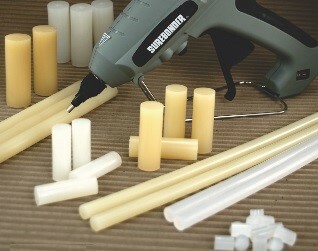 Surebonder is a leading "Made in the USA" manufacturer of hot melt adhesives and supplies a broad range of industrial glue guns including dual temperature glue guns and all temperature Hot Melt Adhesive glue sticks. An extensive range of Surebonder glue guns including high temperature, low temperature and dual temperature and pneumatic models for industrial applications requiring hot melt adhesives. A broad range of adhesives and supplies is also offered for most applications.